In the wake of the Nice massacre which killed 84 people, #PrayForNice and #JeSuisNice have been trending online, echoing the all-too-recent outpouring of grief and frustration following the Paris attacks. Crowds had gathered along the city’s waterfront Promenade des Anglais to watch fireworks marking Bastille Day when a truck ploughed through revelers. The vehicle covered some 2km before the driver was tackled by police. While #PrayForNice and #JeSuisNice were used in the hours after the attack to express both grief and support for the victims, locals offered shelter to those in need using #PortesOuvertesNice. A similarly helpful tweet campaign was used in November after the Paris attacks to help house people who were unable to get home that night. Meanwhile, #RechercheNice is being used by people looking for missing friends and family. Facebook’s safety check was also activated after the attack, allowing people to check in and inform their online friends of their safety. At the beginning of this morning’s Tour de France a minute’s silence was held for the victims while at the British Open golf tournament the French flag flew at half-mast. 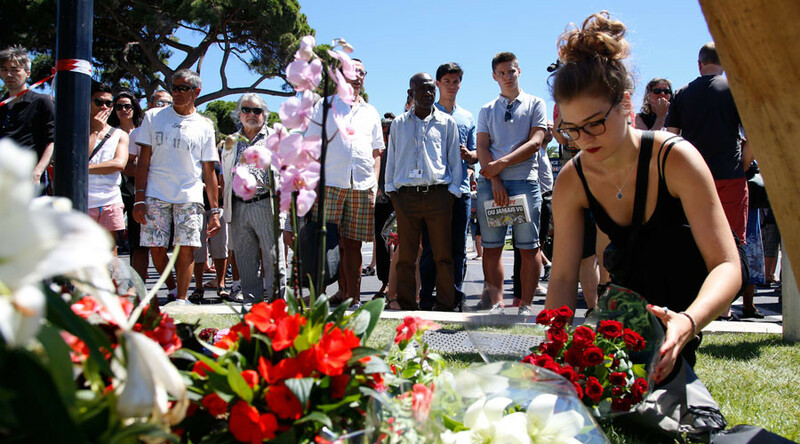 “My heart is with the people of Nice,” French footballer Yohan Cabaye tweeted, his sentiments shared by members of the sporting community including Formula One team McLaren. Je suis sick of this sh*t.
The injustice of the killing of innocent people is expressed in one tweet with the words, “They just wanted to admire the sky, not join it” accompanied by an image of the Bastille Day fireworks.